1 Mrs. Neeta Mishra M.A., B.Ed. 5 Mrs. Arti Srivastava M.A. (Sanskrit), M.A. (Ancient Hist. ), B.Ed. 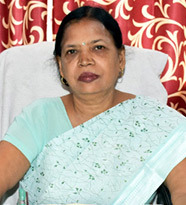 6 Mrs. Ruchi Srivastava M.A. (English), B.Ed. 7 Mrs. Shalini Srivastava M.Sc. (Chem. ), B.Ed. 12 Mrs. Deepa Agarwal M.Sc. (Applied Microbiology & Biotechnology), B.Ed. 13 Mrs. Sudha M.A., B.Ed. 1 Mrs. Raj Laxmi Sharma B.Sc., M.A., L.T. 2 Mrs. Poonam Rani M.A., B.Ed. 3 Miss. Anshu Malini Sharma M.A., B.Ed. 4 Mrs. Pramila M.A., L.T. 5 Mrs. Archana Mohan M.A., M.Ed.